Following the Central Election Commission’s official announcement proclaiming the re-election Monday of President Serzh Sargsyan, opposition candidates and human-rights groups are contesting the legitimacy of the vote in which Sargsyan has claimed some 57 percent. Runner-up and leader of Heritage Party, Raffi Hovannisian, is himself claiming victory, despite the CEC’s tally that saw him get about 36 percent of votes. Further, candidate Hrant Bagratyan (about 2 percent in the official count) is claiming that Sargsyan “stole” votes that otherwise would have gone to Bagratyan (who officially got around 30,000). In a speech around midnight Monday, Hovannisian said that “for the first time in two decades the people have won” and urged Sargsyan to accept the people’s wishes, further adding that “whoever distorts the voice of the Armenian nation and Armenia will be held accountable”. Early this morning Helsinki Citizen’s Association Vanadzor office leader Artur Sakunts – his organization visited 50 polling stations with 16 mobile groups observing the elections – stated that not only the election processes were violated, but the election results have been forged. “From 10 a.m. to 3 p.m. there was a large stream of voters, the turnout was high as compared to the parliamentary elections. Crowded masses were a perfect opportunity for election bribes. There were ‘posts’ outside the polling stations from where people were able to coordinate outflow of information on absent voters. It was with their help that the bribing or ‘encouraging’ was carried out. When there was a special vehicle, voters who had cast their ballots were eager to approach, offer a greeting, etc,” says Bakunts (alleging that voters were collecting bribe promises). Sakunts also said that his office sent seven written violation reports to the police and CEC, but received no responses. 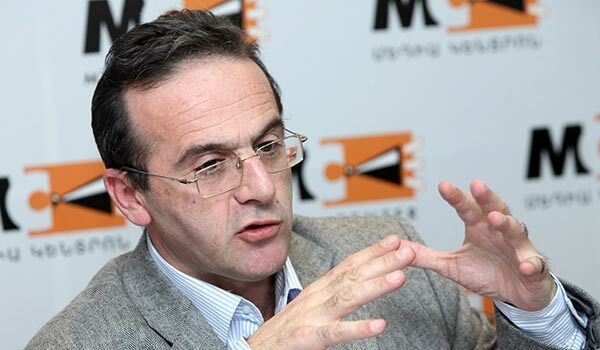 CEC chairman Tigran Mukuchyan stated that the commission received no written complaint, and all the hotline calls about violations were considered and analyzed. According to the information released by the Prosecutor General’s office, 72 violation reports were acted upon, 50 among them were the result of the Prosecutor General’s office’s monitoring of mass media, and five were hotline calls. Two criminal cases have been filed for attempted double-voting and voting in place of another person. One case has been sent to the Special Investigation Service, the other calls are being examined at the police. The Ombudsman’s office statement says the entire burden of public distrust towards the election results lies on the police, and that untrustworthy work of the police would mar all the positive achievements of these elections.